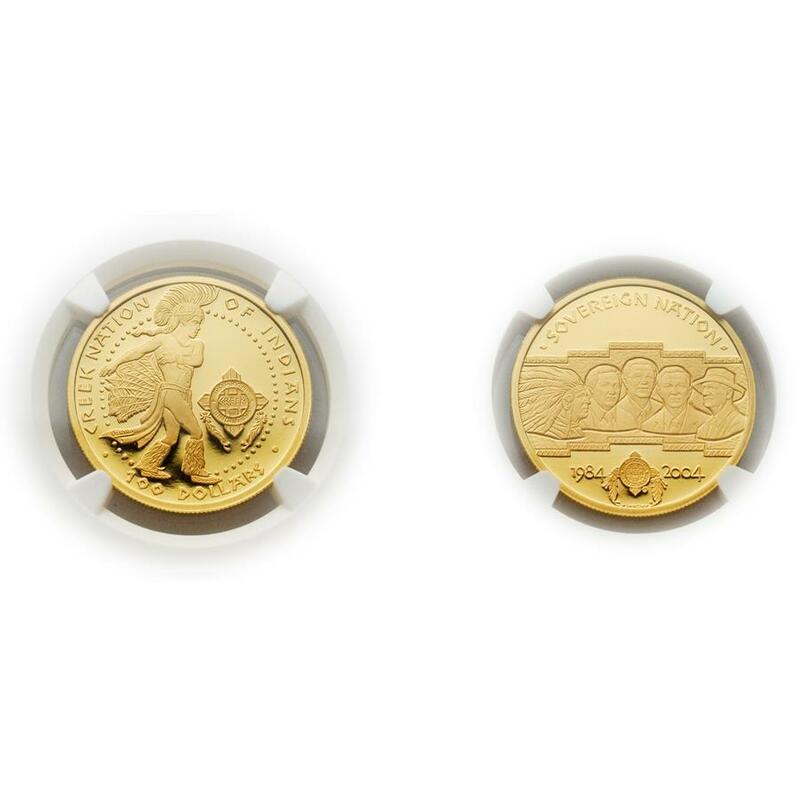 One of only 300 superb gem coins produced at Australia's official Perth Mint. Comes in presentation box with serial numbered certificate of authenticity. We are pleased to offer at the official issue price. 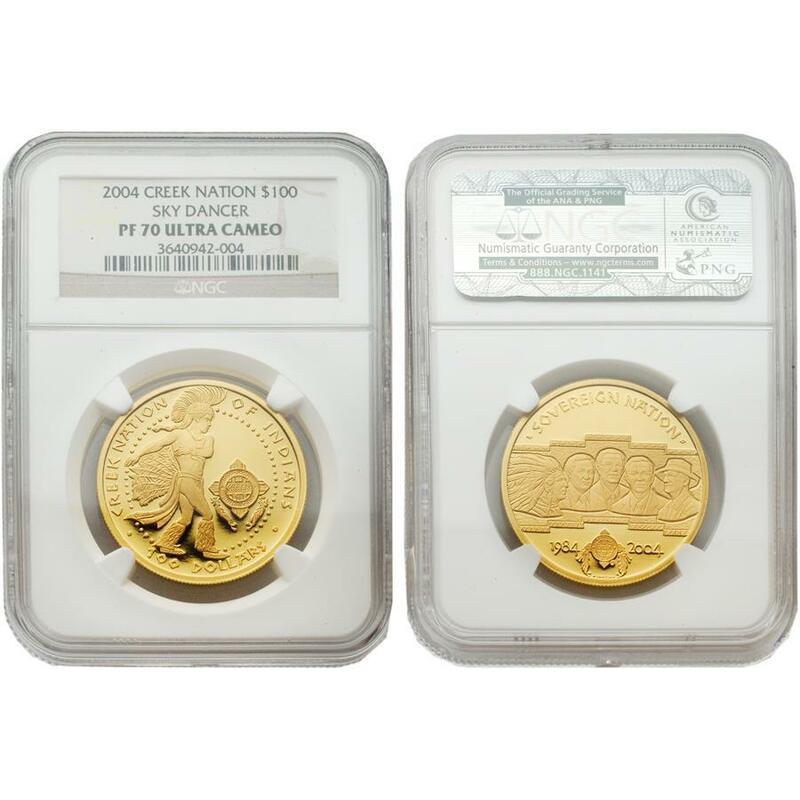 Tribal Chairman Eddie L. Tullis authorized the issuance of their first coins in 2004 to commemorate the 20th Anniversary of Recognition of the Sovereign Nation of Poarch Creek Indians by the United States. The Poarch Band of Creek Indians have lived together for nearly 150 years; it is a segment of the original Creek Nation. The Creek Nation originally occupied a territory covering nearly all of Georgia and Alabama. The War of 1812 divided the Creek Nation between an Upper party hostile to the United States and a group of Upper and Lower Creeks friendly to the government. After the victory, the Creek Nation reluctantly agreed to an enormous cession of land to the United States. Those Creeks who had actively fought with the United States were permitted a reservation of one square mile in Alabama. Today, there are approximately 2,270 members of the Poarch Creek Indian Tribe. On August 11, 1984, the United States Government, Department of Interior, and the Bureau of Indian Affairs acknowledged the Poarch Band of Creek Indians as a Sovereign Indian Nation.